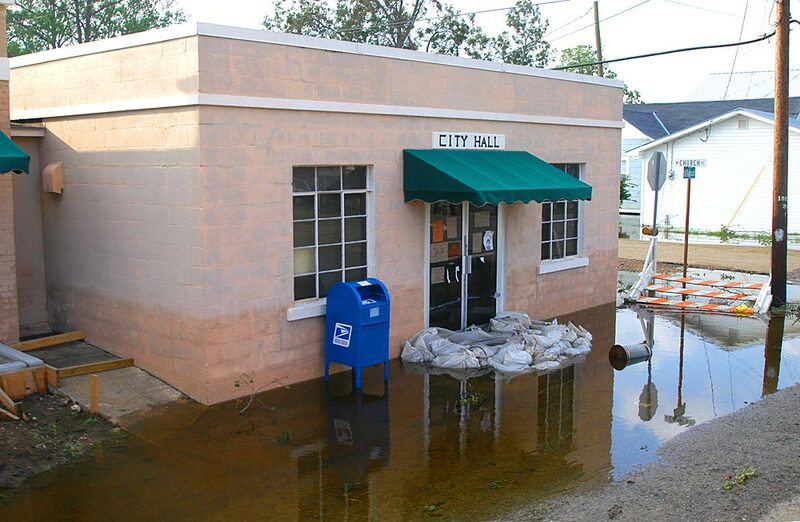 Delcambre, LA, September 25, 2005: The town's city hall, once under two feet of water, shows evidence of an attempt to sandbag the water out of the structure. Public facilities were among the many buildings flooded by Hurricane Rita. Photo taken by Win Henderson / FEMA. Click image to enlarge. Why do I need flood protection? Every year there are more natural flood disasters caused by rising river waters or a hurricane’s ocean surges. You can have either “dry floodproofing”, where the building is impermeable by providing barriers against flood waters entering the building, or “wet floodproofing”, where the building is made with the intention that the uninhabited lower level of the building will flood, but will remain structurally sound. 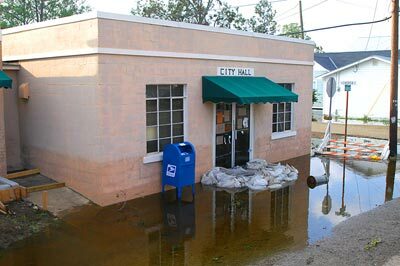 Should I install flood mitigation products on my commercial property? All commercial and most multi-unit residence are required by code to be protected from flood waters. Given the importance of the first floor in most commercial buildings, it is customary to design them to be “dry floodproofed”. Can I install flood protection products on my home? You can, but is not usually required by code. The costs to dry floodproof a house are very high since full perimeter (all walls and openings) and foundation must be protected from the forces of floods. It is usually much better to “wet floodproof” a residence when it is designed. To what height do I need to protect my commercial building? The flood code requires that the Designed Flood Elevation for buildings and structures that are to be floodproofed must be equal to the 100 year flood plain (BASE flood elevation) plus 1 foot for NFIP insurance purposes. What flood barrier design is best for me? Frequency and force of floodwaters. Warning time, i.e. the amount of warning time your location gets before the flood event impacts the building. This will largely define what type of barrier system is best suited for your needs, as there is no point purchasing a system that you cannot install in time. Expected amount of manpower available to install the barriers on the building. If you cannot guarantee the manpower necessary to install the barriers, they should be automatic or specifically made for ease of installation. When do I put up the flood barriers? This is one of the reasons a good Flood Emergency Response Plan (FERP) is so important. I It will define the trigger point as to when it is necessary to implement the FERP and install the barriers. It is also dependent on the number of barriers to be installed. But as a general rule, official weather warning programs work on a 24 hour notice before event impact. This is considered practical due the unpredictability of their tracks and where they will impact. Our flood consultants can provide full-scale FERP for commercial and public buildings. It is recommended to inspect and carry out any maintenance necessary on an annual or bi-annual program. This is to guarantee the integrity of the rubber seals and any other perishable items as well as the general condition of the system. How do I create a Flood Emergency Response Plan? 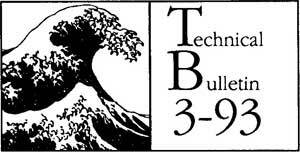 See Flood Emergency Response Plan (click to open in a new window) or TB 3-93 (click to open in a new window). Our flood consultants are trained to provide custom plans that meet FEMA standards and safeguard your people and property. How do I determine my BASE flood elevation (BFE)? Visit the FEMA map service center (click to open in a new window) where you can search for BASE flood elevation and zoning classification. What is Designed Flood Elevation (DFE)? It is the elevation (NGVD) which is set by code for the building that all flood proofing engineering and adjustments must match. For example, if the ground NGVD elevation is at 4 feet and the BASE flood elevation is at 8 feet, the Designed Flood Elevation has to be 8 feet to match the BASE flood elevation, and then add 1 foot for NFIP purposes = Designed Flood Elevation for project 5 feet above ground level = NGVD 9 feet. Yes, it is a required by code as part of permit application package (see TB 3-93). Yes. It is a Federal requirement and a fundamental part of the flood proofing process. What is a Flood Certificate? It is a FEMA document that records the fundamental information for the project, such as the flood zone category for the site (AE AO etc), site address, owners name, site elevations, etc. (See Flood Control Basics, Flood Certification). Who signs the Flood Certificate? The Design Professional Engineer or Architect of Record. Yes, it must accompany the Flood Certificate in the permit pack. By contacting floodsmart.gov (click to open website in a new window). They will answer any questions regarding flood insurance. What is required to apply for a flood permit? Flood Certificate (FEMA Form 81-65)- 2 copies signed and sealed by the design professional of record for the project. Reference FEMA 3-93 for all additional information required with this form. Site Plan of the Building- 2 copies signed and sealed by the design professional of record for the project. The plans need to show all openings in the structure and their relative NGVD or NAVD to the Base Flood Elevation (BFE). The property line must also appear on this sheet. The amount of time it takes to react to a flood threat and install/activate all the flood defense measures.